Invacare® Quick-Change Crutches offer a solid one-piece crutch frame in lightweight anodized aluminum with push-button height adjustment and contoured handgrips. Invacare® Quick-Adjust Crutches' one-piece handgrip assembly eliminates the need for wing nuts and other assembly pieces. Plus, the push-button height adjustment and patient height guide allow the crutch to be fitted to the proper user height. Strong and comfortable, Invacare® Bariatric Crutches range in size from adult to tall adult. Large, double push buttons allow for height adjustments in 1" increments. -Junior Crutches (607JR/8115-J): Height Range of 4'5" to 5'2" with a weight capacity of 350 lbs. 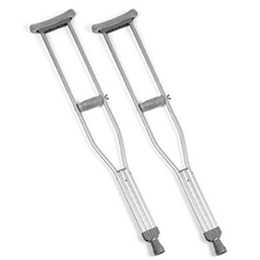 -Adult Crutches (607A/8115-A): Height Range of 5'2" to 5'10" with a weight capacity of 350 lbs. -Adult Tall Crutches (607T/8115-T): Height Range of 5'10" to 6'6" with a weight capacity of 350 lbs. 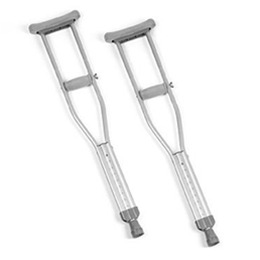 -Bariatric Crutches (656/8130-A): Height Range of 5'2" to 5'10" with a weight capacity of 1000 lbs. -Bariatric Tall Crutches (661/8130-T): Height Range of 5'10" to 6'6" with a weight capacity of 1000 lbs.